[mks_dropcap style=”square” size=”52″ bg_color=”#3a962e” txt_color=”#ffffff”]T[/mks_dropcap]he education system has become very demanding. It enforces students to memorize and learn lengthy courses in a comparatively short period of time. Hence, students are unable to comprehend the knowledge being handed to them, and therefore seek the help of seniors who have experienced similar problems. At times, the seniors are willing to help but most of the times, due to their own busy schedule and pressure of studies, they are not able to help their fellow juniors. This is where Nearpeer comes into action. [mks_highlight color=”#3a962e”]Nearpeer is a startup by the recent graduates of LUMS Centre for Entrepreneurship. 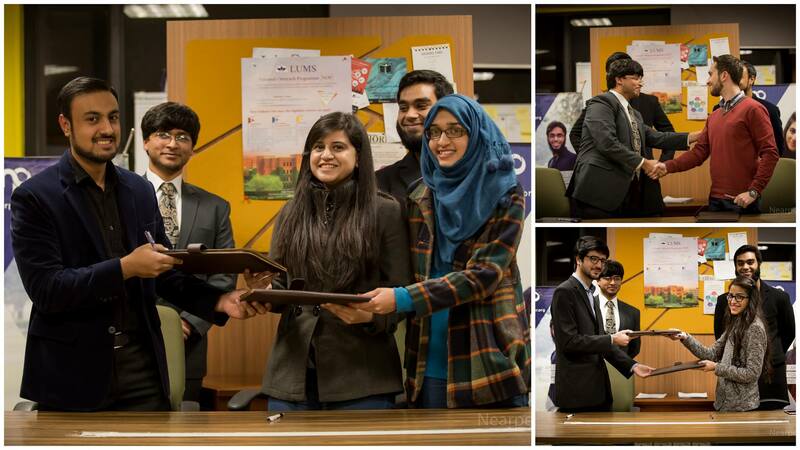 [/mks_highlight]It was co-founded by Shahrukh Swati, Ammar Ali, and Hassan Raza, who are in their senior year at LUMS. Q: What are you studying at LUMS and how did you stumble over this idea? The internet has wide and scattered information; you have to spend a lot of time to filter it. For example the internet provides the same definition of biology for a 7th grade student and for an A-levels student. [mks_highlight color=”#3a962e”]Nearpeer solves these issues by providing a virtual learning experience offered by the graduates of the same courses who have experienced the very similar situations. [/mks_highlight] We hire enthusiastic and passionate people for teaching only. Nearpeer has four core values which are time efficiency, low cost, example oriented and exam oriented courses. Q: When hiring a instructor for Nearpeer how do you determine that a particular person is passionate or enthusiastic? What are the other criteria of hiring? A: We ask a few questions from the applicants during the interviews to know their experience and passion like how many hours they can work for Nearpeer? What is the motivation behind joining Nearpeer? What was their performance in the course they want to teach? Etc. We also ask them to submit a short video demo on any topic so we can know how confident that person is, whether he is suited for this job or not. If the instructor or the recommended book/syllabus has changed at the university for a particular course, then that course will not be offered at Nearpeer. As you see the peers can effectively help you when they had the same instructor and course as you have. We follow a proper strategy and protocol for hiring, almost 170 people applied to our recruitment drive, out of which we shortlisted 130 then hired 13. Q: Does Nearpeer provide video making assistance to the hired instructors or they have to manage it all by themselves? A: Yes, we do assist them. We train the hired instructors for making videos. [mks_highlight color=”#3a962e”]We provide them with mics and tablets to record their videos and also install the right softwares needed for this purpose. [/mks_highlight] I personally suggest them certain tutorials through which they can learn. Which pen color to use, how to write to make the content more visible; all training is provided to them. We do not reject the videos made by the instructors but we do give them an “alert message” if the quality is low or the video rating is going down. The videos of one of the courses were not good at all, so we had to drop that course to maintain our quality. Therefore, out of the 13 hired, 12 are working with us at the moment. Q: How do you select which courses to introduce on Nearpeer? A: [mks_highlight color=”#3a962e”]The courses are selected on the basis of the level of difficulty[/mks_highlight] for example the technical subjects have a greater difficulty level. [mks_highlight color=”#3a962e”]The other criteria are number of students taking that course and the timings of class[/mks_highlight] for example the day scholars usually arrive late in the 8am or 9am classes so they may want to gain better concepts of that course on Nearpeer. In the near future we shall have theory based courses on Nearpeer too like law and philosophy. Q: Were the professors offended when they came to know that you are offering their courses on Nearpeer? Nearpeer is not for people missing the classes. It is to better catch certain difficult concepts and increase understanding. We are not replacing the education system but we are supplementing it. Of course there cannot be any peer when there is no education system. Q: You are charging Rs. 350 per module. How many modules are there per course and what percentage of money goes to the instructors? A: [mks_highlight color=”#3a962e”]There are 3 modules per course,[/mks_highlight] hence its Rs. 1050 per course. 70% of which goes to the instructor and out of the rest 30%, 7.5% goes to the LUMS Centre for Entrepreneurship, 3.5% goes to the person hosting our payment method and 19% goes to Nearpeer. A: There is a small canteen at LUMS that we call “Khokha”. [mks_highlight color=”#3a962e”]We have made our scratch cards that the students can buy from the Khokha. [/mks_highlight] It’s just like a mobile scratch card; you have to enter the digit code on the website. Q: After your launch you were bombarded with many controversies. Can you explain them and how did you counter it? A: That’s right. After 5-6 days of our launch, Nearpeer was the talk around the university. The LUMS discussion forum was fully loaded with people commenting on our idea. [mks_highlight color=”#3a962e”]Some of the conflicts were that we are having Teaching Assistants as our course teachers so now these TAs will not guide students during office hours;[/mks_highlight] they will not give students classes. Our answer to it is we didn’t hire the TAs as instructors first of all. They first joined us and then later became TAs. Secondly, we didn’t allow any of the TAs to market their courses in their lectures or to the students in any way. Still, if such a situation arises, you don’t start crying you properly go the professor to make a complaint. To remove this conflict of interest we changed our policies and now we don’t have any TA’s as teachers on Nearpeer. [mks_highlight color=”#3a962e”]The other criticism was we are putting a price tag on education. [/mks_highlight] At LUMS where the students pay the fee in lacs for their semesters I do not think paying a few hundred should be an issue. Then you say that there are students who are studying on fully funded scholarship at LUMS too, what about them! I personally know these students and they have no problem paying this little amount of money. The fee per module is equal to a McDonald’s burger; we are making it as cheap as it could be. After this claim we even invited the teachers if they want to teach for free. And guess what? There were none! [mks_highlight color=”#3a962e”]Another criticism was we are introducing a short cut in learning by presenting the students quick practice questions and past quizzes. [/mks_highlight] To clarify out of the 1000 videos on Nearpeer only 41 are purely practice questions, 15-19 are purely based on past quizzes and 40 purely provide examples of concepts. All the rest of the videos actually teach the concept. LUMS Centre for Entrepreneurship supported us throughout this and even the Vice Chancellor LUMS called us in our office, he appreciated our vision and efforts. Q: Do you see any competitors in the market? A: We are the first operational MOOCs at LUMS. There are other websites like Khan Academy which were seen as our competitors. They are dealing in broad categories of study while we are providing very specific, particular to the institution courses. Secondly, our payment method is very appealing and different from others. A: [mks_highlight color=”#3a962e”]We aim to expand to other institutions like NUST, LSE. [/mks_highlight] We will focus on strategic learning and provide videos for SAT, GRE, GMAT. Apart from the expansion plan we envision to build Nearpeer as a community oriented learning platform where the students can make their profiles, make learning groups, share files and resources. We want to make learning collaborative through Nearpeer.